I’ve always loved Casa San Angel and its adjoining restaurant, Tala. It’s just one of those places that envelops you in a gentle welcome…and now I know why: because everything about it is infused with the personality, energy, and warmth of the owner, Señora Homa. Señora Homa is a born story-teller, so as we sat in Restaurante Tala, drinking coffee and eating fresh baked corn bread (try it, it’s delicious), she told me how she came to build a thriving hotel and restaurant entirely from scratch, and alone, but sort of accidentally. However beautiful Casa San Angel is, it was never THE plan. 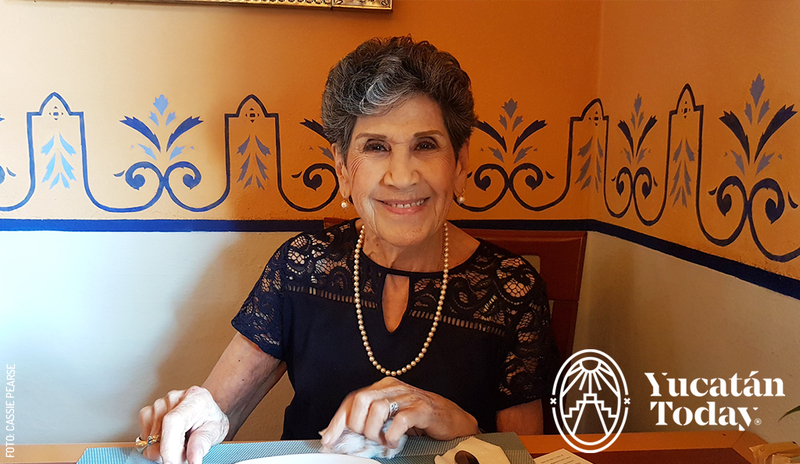 From baking cakes in México City to Casa San Angel in Mérida was a journey fuelled by strength, determination, and, in Señora Homa’s own words, an ability to thrive on change. 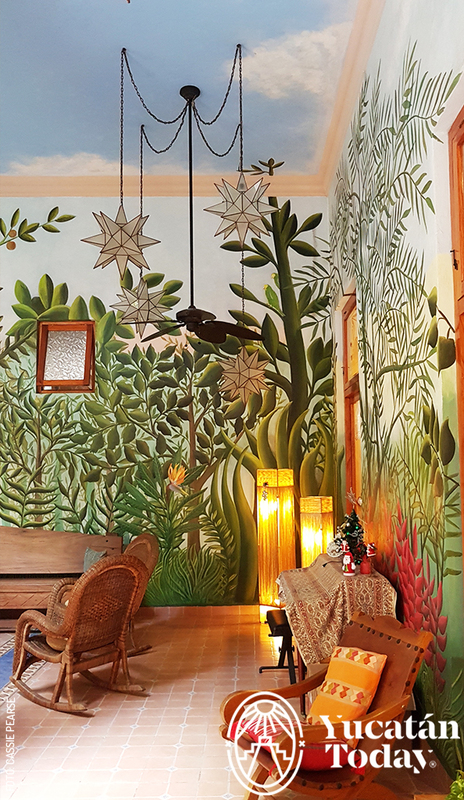 Nothing about either Casa San Angel or Tala could be described as ‘average’ or ‘run of the mill.’ The hotel is decorated with eye pleasing murals and greenery. Two parrots live in the hotel; they hang out where they please and return to Señora Homa when she calls to them. Tala feels genteel and always welcoming. The menu is delicious and everything is freshly made on site. Homa tells me that currently the restaurant shuts at 7 pm because its menu just doesn’t lend itself to evening dining, it’s much more suited to breakfast and lunch; but this will change in 2019 as she once again embraces her desire for change and adds Persian dishes (for Señora Homa is originally from Iran), to the menu. Her story really begins in 1971 with a fifteen-year old son in México City demanding his mum buy a friend’s recipe for a delicious cake he loved. Eventually she gave in, bought the recipe, and began making cakes for him and his friends. Word spread, and neighbors got in on the cake eating business too. Then, as Señora Homa puts it, she decided to take a chance and see if she could sell her cakes to a local restaurant. This decision was made at 11.30 pm one night, and instead of waiting until the next day, she packed up freshly baked cakes and drove down to a restaurant her family loved to ask if they’d like to sell her wares. They agreed and she went home. Then, at 1.30 am she decided she had to head back to the restaurant (it closed at 3 am) to see how things were going. I just loved the grin on Homa’s face as she remembered how she couldn’t wait until the next day to see how her cakes had sold: there was no cake to be seen because it had all been eaten within minutes. She was asked to come back the next day to speak with the owner about providing a regular supply of cakes. From there, demand grew as the restaurant’s supplier introduced her to grocery stores who all wanted to buy her cakes. By 1976 she had moved from making cakes in her kitchen to renting a full bakery. Eventually Señora Homa bought land and built Plaza San Angel in Altavista, CDMX, still a well-known spot in the city. Señora Homa told me she gets bored easily (we laughed together about this, since I also love change and excitement in my life); so, when she visited her son in Mérida in 2001, she decided to buy a plot of land and open a bakery here, leaving behind everything she’d established in México City. Because, why not? Originally she had planned a bakery but was told she had bought in such a wonderful location that she should do more, so she decided to open a B&B, which then morphed into the wonderful boutique hotel Casa San Angel and Restaurante Tala that we know today. While Restaurante Tala clearly provides a sense of fulfillment for her, Señora Homa still wants her bakery. She has a small baker’s kitchen out the back of the hotel, but plans on enlarging it and adding to the restaurant’s menu in the coming months. Despite being the doyenne of the business, Señora Homa told me she’s still in the kitchen most days, tasting sauces or ensuring cakes are baked to perfection. As the menu changes to include more Persian dishes, she plans to be yet more involved. The restaurant’s hours are also set to change in the new year, opening later to provide evening dining options. Señora Homa expressed her gratitude for the valuable, unconditional help and support she’s had from her children Alberto and Ruby Banuet Abhari. Señora Ruby is in charge of the two beautiful shops inside the hotel: 100% México and Pineda Covalin. Señora Homa describes herself as stubborn. I’d call her strong, but whatever adjective we use, Casa San Angel and Tala are a direct result of her tenaciousness…and our luck that they’re here in Mérida.